Have you noticed that none of the mainstream Jewish organizations have expressed much anger about Pam Geller’s anti-Muslim hate signs going up on trains, buses and subway stations in the Bay Area, New York and now Washington. A couple have issued mild statements of tepid disapproval (most have said nothing) but without any of the vehemence they employ when say, a pro-Palestinian student group organizes at some college somewhere. The organizations seem not to get that (1) these ugly placards insult Muslims and incite violence against them (after all, how else to respond to “savages”) and (2) these ugly placards endanger Jews who could be turned on by those set off by the signs. Personally, I think Pam Geller would like to see the shedding of blood by either side as a tool for her fundraising efforts and to help spread her message of hate. But the Jewish organizations are quiet. My guess is that one reason why is that many of them share donors with Pam Geller (AIPAC, in particular) and never, ever want to anger a donor. Another reason is that these organizations never express concern about Muslims, other than to denigrate them. Every major Jewish organization supported the Gaza war, opposed the Goldstone report condemning it, and demanded that the U.S. veto Palestinian statehood at the United Nations (even though the resolution they forced us to oppose embodied U.S. policy). And, third, they are all busy demanding more sanctions on or war with Iran to be too concerned about hate here at home. But then today the organizations demonstrated yet again where their hearts are. 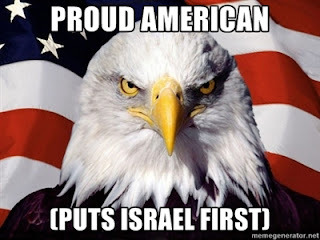 They are responding with a mighty roar to word that fifteen church organizations are demanding that Congress evaluate the $3.5 billion U.S. aid package to Israel The churches ask that before aid is disbursed Congress should determine that the recipient is in compliance with U.S. law. In response, the Jewish organizations went ballistic, coming this close to calling the letter anti-Semitic (what a surprise!). Here is an excerpt from a letter sent by the church groups as reported by JTA. As Christian leaders in the United States, it is our moral responsibility to question the continuation of unconditional U.S. financial assistance to the government of Israel. Realizing a just and lasting peace will require this accountability, as continued U.S. military assistance to Israel — offered without conditions or accountability — will only serve to sustain the status quo and Israel’s military occupation of the Palestinian territories….We request, therefore, that Congress hold Israel accountable to these standards by making the disbursement of U.S. military assistance to Israel contingent on the Israeli government’s compliance with applicable U.S. laws and policies. Now, the organizations may not know this but the disbursement of all domestic assistance (Social Security, food stamps, subsidies to farmers and everyone else) is contingent on “compliance with applicable U.S. laws and policies.” Moreover, the current economic situation has put all those programs under scrutiny, and most have sustained cuts which have cost many Americans (including cops and teachers) their jobs. The one program exempt from scrutiny and from cuts is the aid to Israel program. In fact, every budget slashing proposal passed or pending in Congress exempts Israel and only Israel (no, the U.S. military is not exempt while the Israeli military is). And now AIPAC’s satellite organizations are screaming at church groups for simply asking that we subject Israel to the same process that we subject Americans too. Take a look at the statement from the Jewish Council On Public Affairs. It is the policy arm of the Jewish federations, the largest Jewish domestic charity in the country. Once its focus was almost entirely on Jewish needs here. Now, like the others, it is just AIPAC lite, agitating over Israel, Palestine and Iran (Iran, Iran). Here is what its head Rabbi Steve Gutow (former AIPAC official) and his nominal boss Larry Gold said about the church letter. “The singling out of Israel by the signatories is disappointing but not surprising,” said JCPA Chair Larry Gold. “Although the letter acknowledges that Palestinians share some responsibility for the conflict, there is no call for investigation of Palestinian intransigence. It is telling that the call for action regarding human rights in other parts of the world is reduced to a mere footnote. “We eagerly await the day when these church leaders step away from their troubling fixation on hurting Israel and adopt an approach to peacemaking that fosters reconciliation rather than conflict,” said Gutow. Crazy? My favorite part is where the letter specifically supports “targeted” aid to Palestinians (both measly and with so many conditions USAID barely knows how to legally deliver it) while demanding that the massive Israel program be unconditional. And naturally Gutow talks about how “most Americans” support unconditional aid while, of course, knowing that it is inconceivable that any American would accept that a foreign aid program be exempt from the requirements we put on domestic programs. And then it goes off about the Copts in Egypt! What a ridiculous letter and, as JTA reports, this is the positions not just of JCPA but of the other organizations too. The worst thing about Israel First organizations like JCPA and the others (see this typically stupid statement from the American Jewish Committee) is that although they intend to put Israel first, they really just support the deadly status quo that could ultimately destroy Israel. Putting conditions on aid, like demanding a settlement freeze or negotiations with the goal of peace and security for Israelis and Palestinians, is the best thing we could do for Israel. It needs peace. Time is not its friend. But these organizations are, in fact, as indifferent to Israel’s real needs as they are to Pam Geller’s incitement. They exist to please donors and to pay their top executives those half million dollar salaries. I guess I shouldn’t call them Israel Firsters (although I always will). They are ME FIRSTERS and to hell with everyone else.